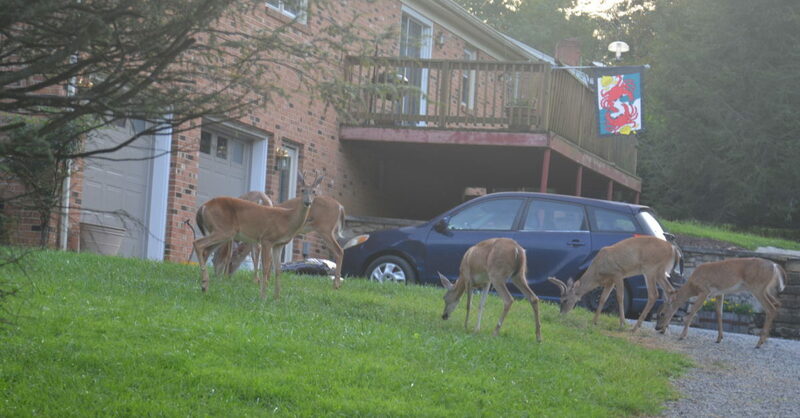 Deer are often overly abundant in Virginia’s suburban backyards. Photo by Bruce Ingram. When I first spotted the mature doe, she was walking idly through the front yard of a Roanoke County suburbanite. By the time the doe was 15 yards from me, I had already trained my crossbow’s scope on her. The shot felt true, and seconds later, the whitetail collapsed about sixty yards away. I had just killed my first deer of the season, and it was still early September. Welcome to Virginia’s Urban Archery Season which began Saturday, September 1 and continues through October 5 and resumes January 6 through March 31, 2019. Nelson Lafon, deer project leader for the DGIF, believes at least four excellent reasons exist for state sportsmen to participate in this season: it’s a great time to mentor novice adult hunters, take youngsters afield, help manage the state’s deer herd which is often overly abundant in our urban and suburban areas, and gives archers a head start on putting venison in the refrigerator. This year, Lafon says 52 localities (and they span the state) are participating in the urban season with the town of Buchanan and Stafford and Prince William counties the newest additions. Hunters should be aware that only antlerless deer (both mature does and doe fawns as well as button bucks) can be harvested, and normal deer regulations apply such as tagging and checking. However, local restrictions apply. For example, in Roanoke County where I predominantly hunt, archers must be afield in a tree stand at least 10 feet above the ground. In Martinsville, archers can only shoot from “temporary platforms elevated at least seven feet above the ground.” In Pearisburg, bow hunters have to be afield on a parcel that is at least two acres and that has been approved by the town manager and chief of police. On the other hand, Poquoson has no special restrictions. I can’t emphasize enough the need to read the specific regulations of the municipality you plan to hunt on. It’s also a good idea to go over those regulations with the folks on whose properties you plan to go afield on. Paying attention to all these regulations is worth it, though, last year, I had already put three antlerless whitetails in the freezer before the Early Archery Season began. I’ve taken both youngsters and novice adults afield in neighborhood back yards and witnessed their success. In fact, in one case, I experienced the joy of an adult killing his first deer. So consider participating in Virginia’s Urban Archery Season this year. Chances are whether you’re a rookie adult, a veteran hunter or a youngster, you’ll enjoy your time afield. Taking someone new with you? Visit Go Outdoors Virginia to Refer a Friend to join you outdoors!